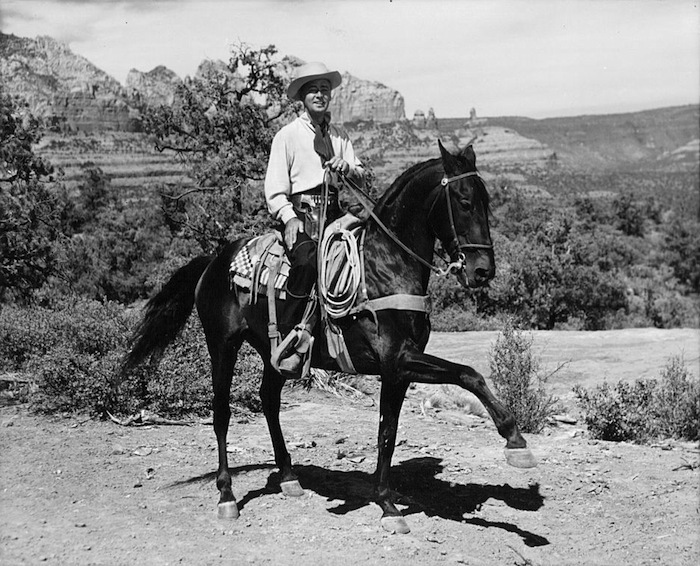 Gordon Douglas | 50 Westerns From The 50s. 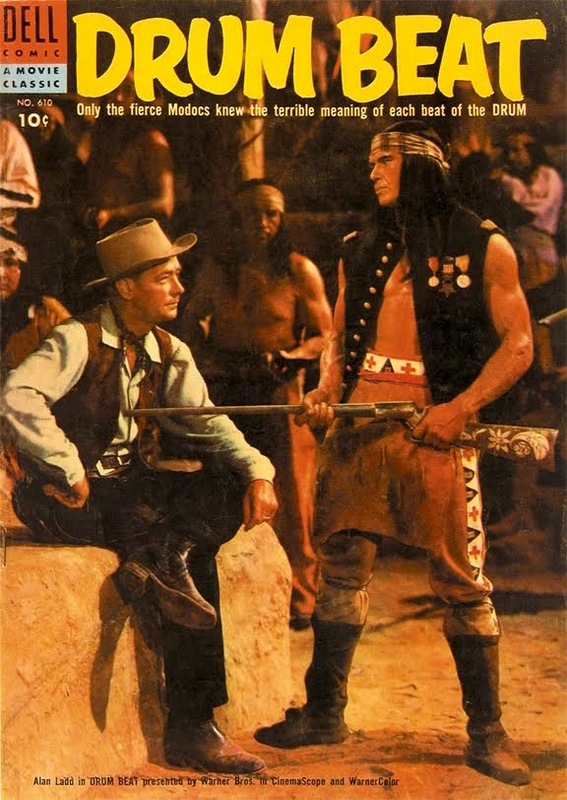 50s Westerns DVD News #207: Randolph Scott Roundup, Volume 2. The first Randolph Scott Roundup was a great thing. And now Mill Creek’s bringing us a second batch of Scott Columbias. There are six good ones here. 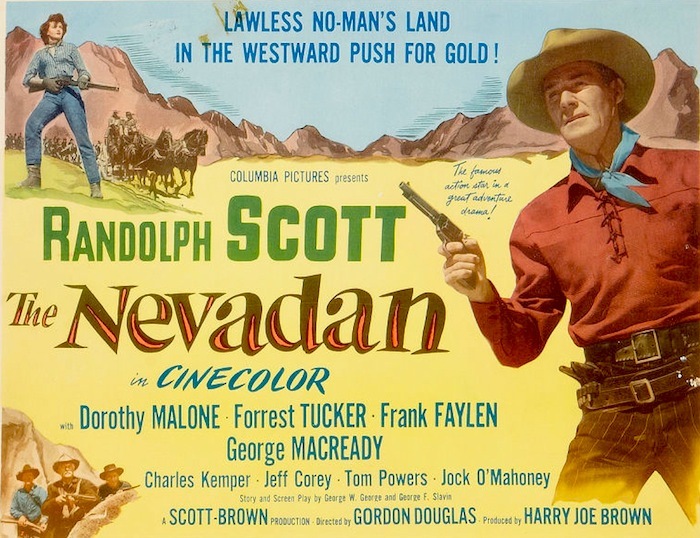 The Blogathon For Randolph Scott: The Nevadan (1950) By Guest Blogger Blake Lucas. This post is part of The Blogathon For Randolph Scott, January 23-25, a celebration of his life and work. 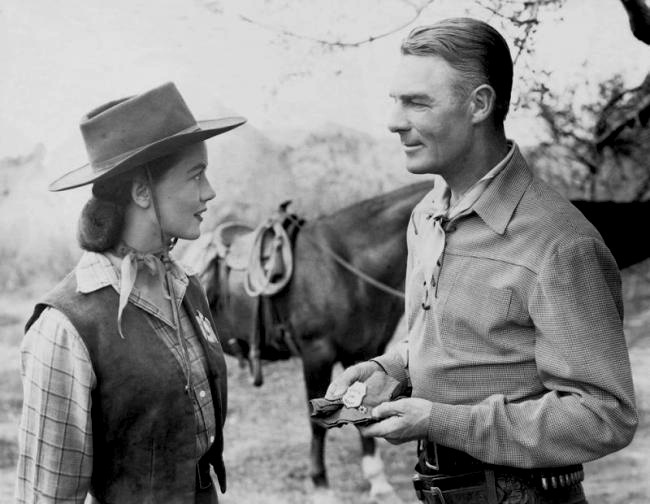 From 1946 to the end of his career in 1962 Randolph Scott starred in no less than 41 movies—allowing some flexibility to contemporary-set The Walking Hills (1949), all but two of the earliest ones are Westerns, a deliberated decision by Scott that was fortuitous for the genre, which flowered through this period. 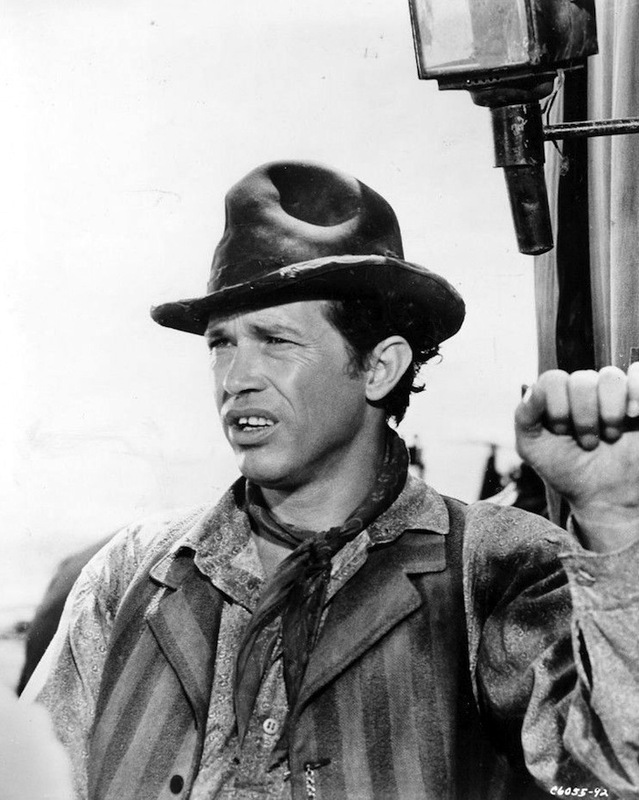 No less important was his partnership with producer Harry Joe Brown at Columbia beginning in 1947 with Gunfighters—17 of these films were made by their production company, which went under various names: Scott-Brown, Producers-Actors, and, finally, Ranown. 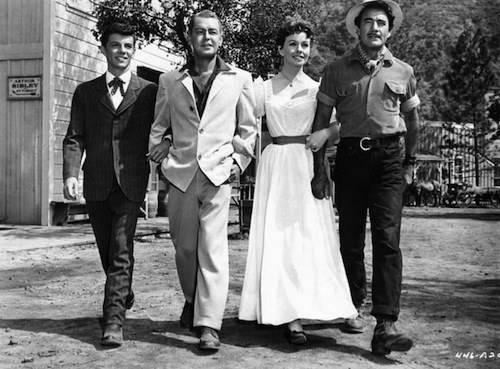 Though it’s less than the greater share of Scott’s Westerns through 1960, these films generally tend to be the actor’s best (a stunning exception is Seven Men From Now in 1956 but by initiating the Ranown cycle it has come to be aligned with it)—the partners plainly looked for good scripts and the films were made with evident care, even though they sought no extra prestige at the time. The Nevadan (1950), fifth of their movies, is arguably their best to date, and if in the end it falls just about in the middle in terms of quality, that’s high praise. And The Nevadan is also significant, as a closer look will show, for being a 1950 movie. There is surely no argument that this was a watershed year for the genre. The directions it begins to take at the time, and all at once, have an unparalleled freshness and flexibility, even if the motifs had always been there. Consider just some of the films: The Gunfighter, which took over what had been a well-used motif of the ill-fated outlaw in the 40s and introduced in his place a figure who may not be wanted by the law but has lived with killing and is coming to an inner reckoning; Winchester ’73, where the revenge motif, seemingly so well-worn by now, is given new life in the evident pathology of both hero and villain within a disturbing blood relationship; Broken Arrow and Devil’s Doorway, which began what is sometimes called the “pro-Indian cycle” but should probably just be called “the Indian cycle” for the new balance and depth brought to all aspects of this part of American history. These examples are far from inclusive, but simply suggestive of the richness to be found in that year’s Westerns. No less important in the present case is that movies that seemed modest on every level might also contribute deeply. So, unnoticed at the time, Saddle Tramp, which plays so sweetly and with apparent casualness, ends with what may still be the most piercing expression—there for a moment and then gone—of the wandering/settling theme and the ambivalence that animates it. Into this landscape rides The Nevadan—a taut 80 minutes in which one can simply enjoy the inventive storytelling, the engaging characters, the beautiful locations, and the rugged action. But within that, it turns out there is a lot going on. 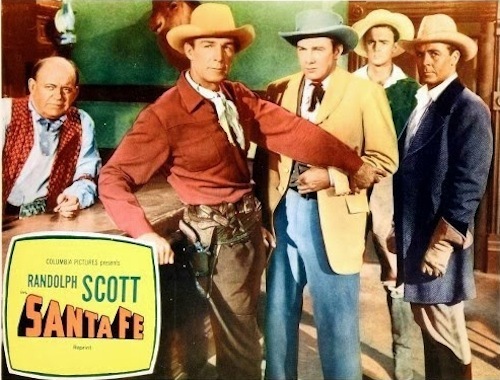 The story is set in motion quickly by the theft of $250,000 in gold by Tom Tanner (Forrest Tucker) and his arrest and escape, followed by wary partnership with a mysterious man, Andrew Barclay (Randolph Scott), dressed like an Eastern dude, who he encounters on the trail. As the plot leads to the abandoned mine where Tom has left the gold, other characters play in and a number of other relationships are treated, all with increasing drama as these characters move toward convergence in the eventful climax. 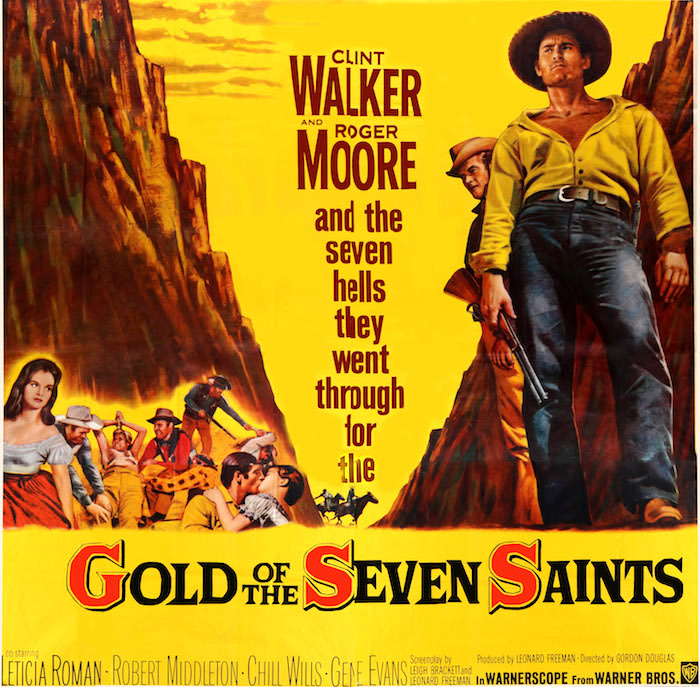 Edward Galt (George Macready), a rancher and saloon owner, wants to take the gold for himself, and his daughter Karen (Dorothy Malone), involved after she becomes attracted to Barclay, comes to see the unhealthiness of her father, both in his obsessive greed and obsessive attachment to her in the absence of her mother who left him long ago. There are also two brothers who work for Galt, Jeff (Frank Faylen) and Bart (Jeff Corey), given considerable attention. The sets of relationships here, treated without the film ever seeming to pause to do so, are all interesting. Of the brothers, Jeff is the meaner one, and at times ridicules the weaker, slower Bart, but is also protective of him and one knows in the end this is where his soft spot lies. The father/daughter relationship is not given the heavy attention of Walter Huston/Barbara Stanwyck in The Furies (same year of 1950) where the incestuous currents are hit very hard, but it has no less sense of a very adult reality—here, it becomes evident that Karen, though affected, is a moral and positive woman who does not share her father’s poisonous feelings, and only needs to see him as he is to step comfortably into selfhood. Most engaging of all though is the friendship between Tom Tanner and Andrew Barclay, who turns out to be a federal agent. There is not a word of dialogue about this friendship, nor anything that actually states it, but it quietly animates the film and becomes more evident until the climactic scene in the abandoned mine. Here, Barclay movingly pleads with Tanner to give up the gold and turn himself in, to end his life of outlawry, while Tanner at the same time insists he means to keep it. 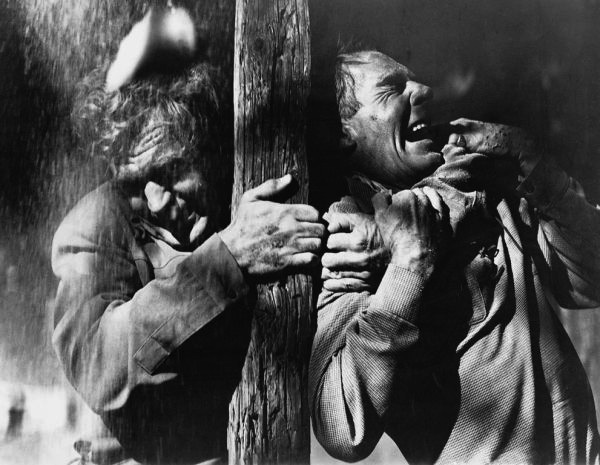 The resolution comes not with a change of heart but with a terrific fight between them in the collapsing mine, the film’s most memorable scene. 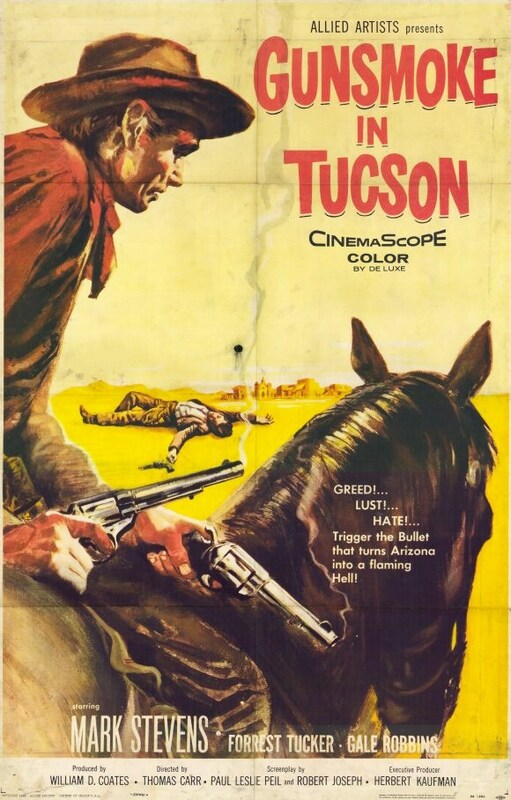 Tom Tanner is the movie’s most interesting character and anticipates one of the deepest themes of the Western in the 50s, that of “crossing over.” It is a provocative theme, and one that in Westerns found great spiritual depth as the decade wore on because it asks the viewer to agree that any sin, crime or misdeed can be lived down, that redemption is something possible at any point in life, that it is the present that is most important. One might not agree—though I believe this theme is at one with the original teachings of Christianity—but that is the view of 1950s Westerns. Of course, the theme may be treated complexly, and not every character who thinks about crossing over is able to, no matter how much they may yearn for it. Very important in Randolph Scott Westerns, the theme flowers in the Ranown cycle in three variations, all involving very different characters and different outcomes—Richard Boone in The Tall T (1957), Pernell Roberts and James Coburn in Ride Lonesome (1959), and Richard Rust in Comanche Station (1960)—each moving in its own way. One can’t claim the same drama for Tanner, yet he is still remarkable for several reasons. First, he is prescient for those characters—even though he is an outlaw, one can’t help but like him from the start and that never changes. And though, as with Barclay, we really know nothing about him outside of what happens in the action of the film, it is still possible to easily see that outlawry was, for him, simply the wrong path—in that climactic scene, when he speaks about the gold, one compares the way he talks about it to the way Galt had talked about it and it is so different, so evident that part of him already wants to give it up, and on some level has given it up. The movie ends as it should in terms of law, but not tragically, and so both the character and his friendship with Barclay are affirmed. George F. Slavin and George W. George can claim their share of good scripts, and this early one is especially so not just because what I’ve considered is palpably there, but also because the writers did not construct it with an insistence on those implicit ideas (one also notes the presence of the interesting Rowland Brown doing some writing on it)—as I’ve noted, the script tells the story but it leaves the realization to bring out all those interesting shadings in the relationships. So it is director Gordon Douglas, plainly a gifted practitioner in most genres, who does most to make it all work. This was his second Western, the first being The Doolins Of Oklahoma the previous year, also for Scott-Brown and also very well-done but in the familiar vein I’ve touched on earlier of ill-fated outlaws then dominant. What Douglas gives here that he came increasingly to master in his best films was layered, dramatic staging in his compositions that by itself conveyed a lot about the relationships—the fine acting of everyone involved completes this and is made even better because they are so dynamic in the frame. The payoff scene between Galt and his daughter Karen as he bends into the image trying to grasp her while she looks out at him and toward the camera is one example, and the choreography of Tanner and Barclay within the mine in the climax is another, but examples are numerous in the film—this is a director interested in relationships and how to treat them cinematically. As his style developed through the 50s, Douglas could also place this layered imagery within even more elaborate outer visual frames that are both fetching and dramatic; that is not so evident here, but simply being so supple in placing actors and staging their interplay, especially in interiors, gives this movie everything it needs. In exteriors, Douglas may not quite as distinctive at this point, or superior to other practitioners in the genre, but he certainly compares well and the movie is always beautiful. Cinecolor (used for the last time here by Scott-Brown) is not as vibrant as Technicolor, but that doesn’t make its blues and rusts or the ambiance they give to the locations any greater naturalism—properly restored and preserved as it now is in this movie, it’s a fetching and indeed striking color process, and very much at one with the drama here. The exterior locations are the Alabama Hills and Lone Pine, always so expressive in Westerns and many of Randolph Scott’s conspicuously so. The cinematographer was the great Charles Lawton, Jr., a Columbia mainstay who fortuitously was there for the end of the Ranown cycle and the magnificent Cinemascope imagery of Ride Lonesome and Comanche Station. And that leads to consideration of another pleasure of Randolph Scott movies, and those of Scott-Brown especially—actors and actresses who were valued and kept being called back. 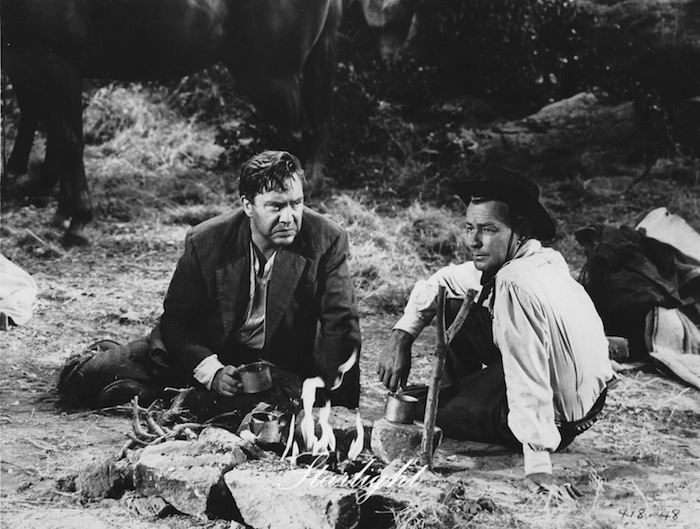 Among the main players, Tucker, Macready and Faylen all had multiple appearances for the company and Tucker is also in Rage at Dawn (1955) with Scott later, while Malone would appear with him again in Tall Man Riding (1955). They are all perfect in their roles, as also Jeff Corey (tragically blacklisted soon after or he’d never have been out of movie work in the 50s, as he was not at any other time) and Charles Kemper as the knowing sheriff (tragically dead in an accident within the year). In addition to those mentioned, Scott and Brown gave a leg up to Jock Mahoney, then known as a great stuntman but coming into acting where he was a natural and would wind up at the end of the 50s one of the last to make his mark as a star, however briefly, in this level of Western in which Scott himself was so important. 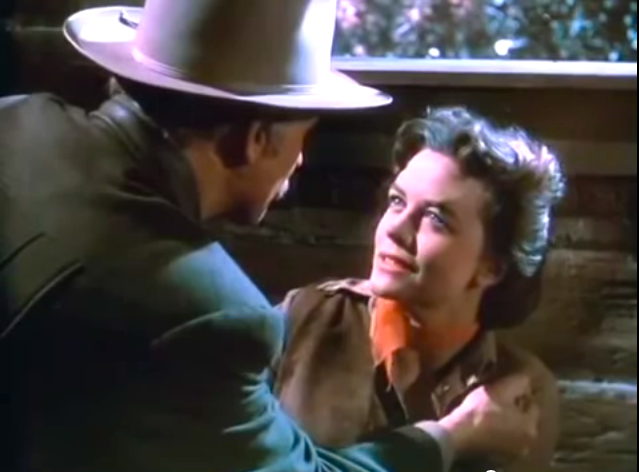 Of the others, I’d single out Malone, who with her Texas twang and naturalness is an icon of the genre, not surprisingly in many Westerns, and of course, Tucker, who makes Tanner so appealing. Forrest Tucker is barely noted in most film histories now but remains very much admired by genre aficionados and I’m sure always will be—he has a strong presence, can play good or bad or (as here) in between, all equally well, and is always convincing. It’s very much to Randolph Scott’s credit than in these, films on which he was a producer, he is not interested in a vehicle for himself as much as he is in a good movie and glad to let others have at least as good a part as his own. At the same time, he holds the center. Increasingly, and this is a good point to consider it, as his hair became greyer and his face and bearing took on more age, he seemed to be aware of what was in his persona. As a young actor, he had ready appeal but with directors who just took him as he was he could also be a little stolid, not deeply engaged in the roles; yet he always had the talent—one only has to see what a caring director like Fritz Lang brought out of him in Western Union (1941) where he is the tragic outlaw who wants to outrun his past and cross over. 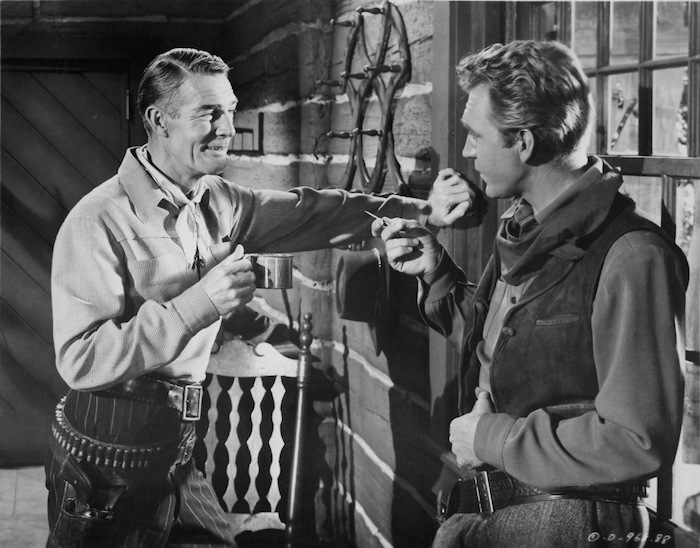 Of course, later, with Budd Boetticher, it was a match made in heaven between the two men—here was a director who “got him” in the most profound way, evident immediately in their first collaboration, and so the director’s sensibility and the star’s persona resonated in a way rare in cinema, and Scott, in a way that few movie stars can claim, became sublime in the final phase of his career, remaining so after Ranown was over and in the company of fellow icon Joel McCrea in the epiphany of Ride the High Country (1962). But looking at his career whole, no director, not even Boetticher, can take all the credit for finding the soulfulness of Randolph Scott. He had been working on it himself the whole time, in modest films like The Nevadan tapping the knowing humor and quiet self-possession, as well as the inwardness and tenderness, that would finally become so awesome in their humanity in the years of full maturity. Blake Lucas is a writer and film critic living in Los Angeles. By bringing together Michael Wayne at Batjac and Robert Gitt of the UCLA Archive, he was responsible for the 2000 UCLA restoration of Seven Men from Now. 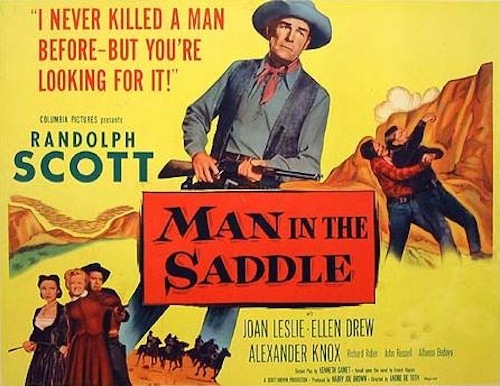 This post kicks off The Blogathon For Randolph Scott, January 23-25. 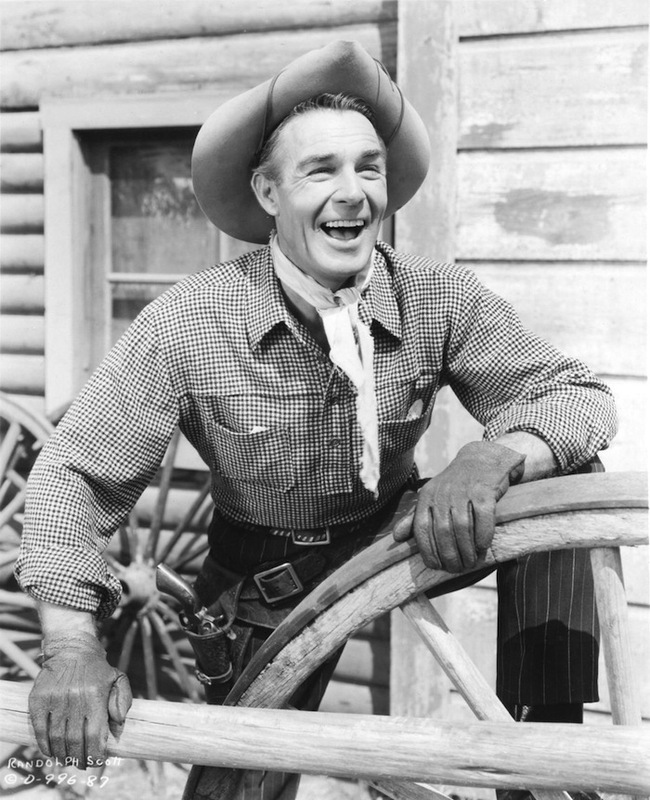 Randolph Scott is my favorite actor, hands down — an opinion that seems to be shared by many who read this blog on an ongoing basis. As a group, Scott’s Westerns were probably the biggest influence on my decision to take on this blog and book on 50s Westerns — they were certainly my “gateway drug” (beginning with 1958’s Buchanan Rides Alone). And though he was just an actor playing fictitious characters in a number of medium-budget, 60-year-old cowboy movies, he became a model for the kind of man I want to be. Teaming with producers Nat Holt and Harry Joe Brown (separately) — and recruiting directors like Gordon Douglas, Edwin Marin, Andre de Toth and Budd Boetticher, Scott made modest, unpretentious films whose merits become more obvious with each passing year. The best of them are among the finest the genre’s ever seen. The lesser ones are worthwhile if only because Scott’s in them. Retiring in 1960 after Comanche Station, Scott was persuaded to climb back into the saddle — to appear alongside Joel McCrea in Sam Peckinpah’s Ride The High Country (1962). And that was it. He passed away at 89, an extremely wealthy man thanks to shrewd investing of his movie money. There are many stories of Scott sitting on Lone Pine locations reading The Wall Street Journal between takes. He saw the “pitcher bidniss” as just that, a business — and found a great deal of success in it. But the quality of the scripts — along with the many talented people he hired, encouraged and re-hired — proves he was paying attention to much more than just budgets and grosses. Movies this good, especially made on tight budgets and schedules, don’t just happen. And speaking of all those movies, many of them will be covered throughout the weekend. Saddle up and read on. DVD Review: Drum Beat (1954) And A Couple Other Ladds. Not long after Shane (1953), Alan Ladd left Paramount, the studio that made him a star, and launched his independent company, Jaguar. Their first film was Drum Beat (1954). Based on the 1873 Modoc War, Ladd plays an Indian fighter recruited by President Grant to find a way to peace with the Modoc. Turns out the tribe wants peace, but a chief named Captain Jack (Charles Bronson) and his band of renegades are lousing things up. Repeated attempts for a peaceful resolution are unsuccessful, and we get a very exciting last couple of reels. Though I’m not a big Alan Ladd fan, I really liked this one. It wears its “sympathetic treatment of the Indians” thing well, but never forgets that it’s action that puts people in the seats. Boy, a lot of people get shot in this thing. Ladd and Daves (and, of course, DP J. Peverell Marley) shot Drum Beat in Warnercolor and the then-new CinemaScope. As was the custom with ‘Scope at the time, they avoided close-ups, went for long takes whenever possible, and gave us lots of gorgeous vistas of Sonora, Arizona, and the Coconino National Forest. 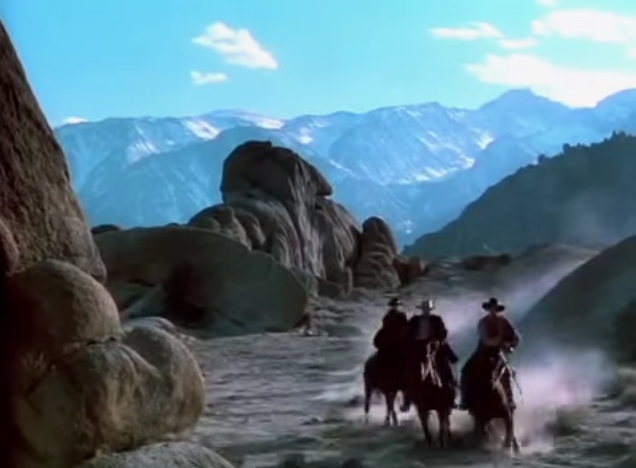 Daves always showed off the landscape in his Westerns, making each setting an essential element of the film, and this is one of Drum Beat’s great strengths. If there’s a film that makes better use of the Sonora area, I don’t know what it is. 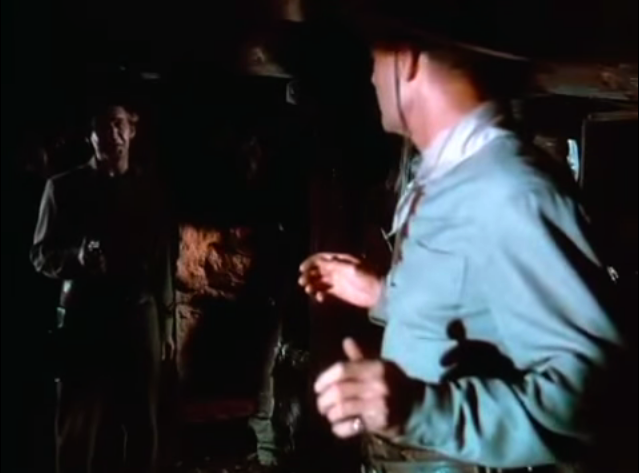 The cast is a 50s Western fan’s dream: James H. Griffith (as a Civil War veteran who lost a leg at Shilo), Frank Ferguson, Elisha Cook, Jr., Willis Bouchey, Perry Lopez, Anthony Caruso, Denver Pyle and Strother Martin (who I heard was in it, but somehow missed). Of course, Charles Bronson makes quite an impression as Captain Jack in his first film under his new name (it had been Buchinsky, which was considered too Russian-sounding in the HUAC years). With Drum Beat, Warner Archive gives us a pretty good-looking DVD. The Warnercolor is, well, Warnercolor — but here it looks as good as I’ve ever seen it look. The image is a tad soft at times (varying from shot to shot), some of which we can blame on the early CinemaScope. The audio is excellent; I love the stereo sound of these early Scope pictures, with an actor’s voice following them as they move around within the wide frame. This is a really good film, and a real treat in widescreen and stereo (I’d love to see a Blu-ray turn up someday). Highly recommended. Alan Ladd and Delmer Daves reunited for The Badlanders (1958), also available from Warner Archive. I haven’t seen it in ages, and I’m really eager to revisit it. 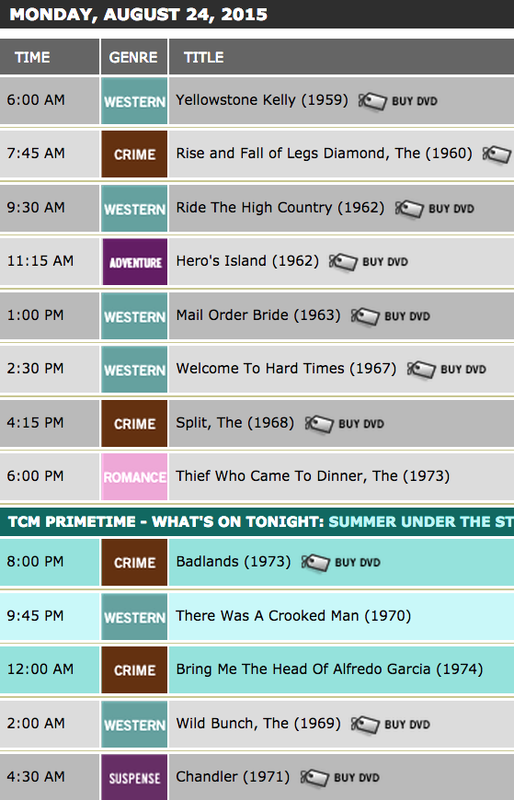 Along with Drum Beat, two more Ladd Westerns came riding into town, thanks to Warner Archive. Ladd’s a cattle man who works to build a town around a railroad hub, which will benefit the local ranchers. Of course, there’s someone who doesn’t want all this to happen. As a drunk, Edmond O’Brien steals every scene he’s in. He’s terrific. This is WarnerColor again, and it’s not as well-behaved as it is in Drum Beat. Good movie, though, especially if you’re a fan of O’Brien or Virginia Mayo. Gordon Douglas is as dependable as ever. This time, Ladd’s a lumberjack who arrives in the Northwest to take out a lot of trees. The townspeople are afraid Ladd’s efforts will cause mudslides and do other environmental harm. Frankie Avalon sings “Gee Whiz Whillikins Golly Gee,” which Bugs Bunny used to sing in the bumpers to The Bugs Bunny Show on Saturday mornings. This tune is just one of the things that put Guns Of The Timberland in that goofy time period that a lot of series Westerns exist in, where Old and New West, cars and buckboards peacefully coexist. Jeanne Crain is beautiful, Gilbert Roland is as cool as ever, and Lyle Bettger actually gets to be a good guy for once. The Technicolor makes it to DVD looking like a million bucks, while alcohol has Ladd looking just terrible.